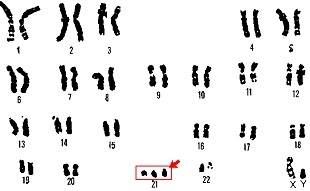 Down syndrome is caused due to an extra copy of chromosome 21, also known as trisomy 21. This is usually caused by an error in cell division called non-disjunction. Non-disjunction is when at least one pair of homologous chromosomes does not separate during Anaphase 1. Thus, the extra chromosome continues to be copied throughout each cell, which then shows effects of down syndrome. Down syndrome is found in approximately one in every 700 children in the United States. Thus, many researchers are quickly trying to find a solution to this error in cell division and researchers, Jane Lawrence and Jun Jiang, may have found a possible solution. The two are experimenting with a gene that is used in females to silence one of their two X-chromosomes. Both female X-chromosomes contain a gene called XIST, when activated, this gene has been identified to produce a RNA molecule that coats the surface of the chromosome blocking genes from being expressed. In females, only one of the XIST genes is activated silencing that specific X-chromosome. The two hypothesized that they could particularly target specific chromosomes, in people with trisomy 21, to silence them. Thus, they used cells from a boy with down syndrome, reprogrammed his cells into a stem cell like state, and used enzymes called zinc fingers nucleases to cut the XIST gene to be able to fit into a particular spot on the 21st chromosome. XIST worked and did its job, it coated the chromosome and blocked genes from expressing but it did not totally silence the chromosome. However, it is important to note that it did not kill the cells to silence a majority of that extra chromosome. This is extremely promising work for a possible treatment for down syndrome. The only downside is that the XIST gene did not silence the entire chromosome leaving some genes to be expressed, and this could cause many other complications in the cell. Furthermore, they would have to ensure that silencing the chromosome wouldn't cause any other chromosomal complications in these people. Moreover, if they silenced the entire chromosome would there be a phenotypic change? How many cells would it take for them to silence to actually make a change? Although the primary research is extremely promising, there are still many questions that need to be answered before this is thought of as a possible treatment for down syndrome. This could lead to a greater understanding of how down syndrome works, and it could possibly show that XIST is a more effective way in silencing genes. I have a cousin with down syndrome, she has one of the worst cases so reading that they have done research like this that could help greater the understanding is very pleasing to know.